What Are the Sneaky Signs of Added Sugar in Food? HomeGENERAL HEALTHWhat Are the Sneaky Signs of Added Sugar in Food? Q: How can I tell if I'm buying a product with added sugar? A: First things first — not all sugar is bad for you. It's actually found naturally in many foods like fruit (in the form of fructose) and even in dairy (lactose). But the not-so-good-for-you kind is often added to foods before serving (like when you put some in your coffee) or during food processing. These added sugars are unique because they have no nutritional benefit. With all of that said, I am actually less concerned about the added sugar you know you're eating, like dessert, versus the sugar that's sneaking into your diet in the form of juice, cereal, pasta sauce, and salad dressings (just to name a few). When browsing ingredients labels, look out for anything that ends with the words sugar (like coconut sugar), sweetener, or syrup should be a red flag, as well as words ending in "-ose" (like dextrose), agave, honey, malt, molasses, evaporated cane juice, and fruit juice concentrate. These are all hidden sugar bombs. The other tricky thing is that many good-for-you foods like yogurt have both naturally occurring and added sugars. The other important thing to understand is how many servings you're eating. 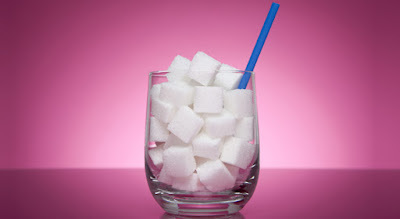 One teaspoon of sugar is equal to four grams, which means that your average 20-ounce soda with 65 grams of sugar is actually serving up about 16 teaspoons. For women, the American Heart Association recommends you cap your daily sugar intake at 6 teaspoons, meaning your favorite drink is almost triple your recommended intake. While the Food and Drug Administration has proposed changing the nutrition facts label to better highlight added sugars (stay tuned! ), the easiest way to cut down is to read the ingredients list carefully. My quick-and-dirty trick for cutting down on added sugars? Try to buy products with sugar in the single digits (e.g. less than 10 gram per serving) as much as possible.